Walter Sikert & the Devil’s Twins are part of “Old School Game Show” at the Wilbur. Hey! Boo! (Much better.) That creepy creeping feeling you’re feeling? It’s the weekend! But it’s also Halloween! Or, close enough to Halloween that we’ll just pretend, because Halloween is all about pretending. Like pretending that Halloween is actually short for Halloweekend, because that’s what’s at the door, folks. If you don’t have a costume sorted out, don’t sweat it. For one, you’ll ruin your make-up; for another, the Weekender’s got you covered. Please find tucked into this week’s offerings a completely unique costume idea for every occasion, provided only one of you goes to each thing. I may need to rethink this. NO WHAMMIES: If you miss the glory days of game shows, with the plaid blazers, extremely long microphones, pre-inflation jackpots, tacky dinette sets, trips to Tahiti, and fate-baiting wheels of fortune, you can solve the puzzle of your Friday night with “Old School Game Show,” a hybrid trivia/sketch comedy/burlesque/music show that whooshes you back to a time when questions had actual answers and everyone on TV was visibly drunk at 10:30 a.m. 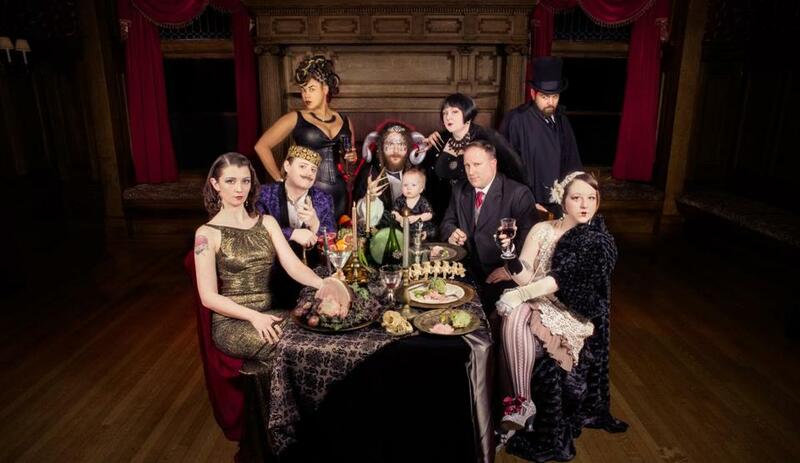 This installment at the Wilbur features musical guests Walter Sickert & the Devil’s Twins as well as comedian Lamont Price. Find tickets here. Costume: Mobster wig + suit + elephant tusks = Chuck Woolery Mammoth. LAST SCENE: One difference between Studio 54 and “Studio 54” — Matt Tyrnauer’s new documentary on the storied NYC nightclub — is you can wear sweatpants and get in. Apart from that, this “lively and largely affectionate documentary offers the scene in all its louche/glamorous glory,” writes the Globe’s Mark Feeney, who brings 2½ stars to the party. (They’re not on the list!) Surviving owner Ian Schrager leads the way through this tale of a CBS studio that “became a home away from home for Mick, Halston, Bianca (not necessarily with Mick), Truman, Cher, Farrah, Liz, Calvin, Sly . . . the list goes on of those on a first-name (or only-name) basis with fame.” Now screening. Costume: White wig + ork tusks + black turtleneck = Andy Warthog. RETRO GREAT: The mid-’90s are kind of tough to look back on. (Believe us. We know.) But “Mid90s,” Jonah Hill’s first time out as a writer-director, makes for a welcome retreat to an awkward age (in a couple senses). It’s a coming-of-age tale that defies what you might expect from Hill at the helm, according to reviewer Tom Russo, who gives this “assured” debut three stars. “It’s as if Hill took his familiar sly humor and sneaked it into a segment from Richard Linklater’s ‘Boyhood,’ ” he writes. Now screening.Costume: Frilly blue dress + blond pigtail wig + chains = Alice in Chains. THE NOISE: Speaking of blasts from the past, Sonic Youth is selling all their gear! Oh wait, wrong news. The Bevis Frond are touring! Led by the world’s loudest genius, Nick Saloman, these pioneers of growly psychy noisy pop have been blowing minds (and amps) since 1985. The band’s 23rd album is due in December, but your tinnitus gets a running start Friday when Saloman and company make a rare US stop at the Rockwell in Somerville. Find tickets here. Costume: Blond wig + stilts + Stratocaster + zombie makeup = Thurston Morgue. LEAD THE WAY: Not to rag on the rest of the paper or anything, but if the news has you feeling down and restless and helpless (and if you’re a big Emmylou Harris fan!) you might consider the Lantern Tour, coming Saturday to the Orpheum. The tour assembles Harris, Jackson Browne, Jerry Douglas, Lila Downs, and Steve Earle on one stage, and serves to benefit the Women’s Refugee Commission and its work on behalf of migrant and refugee families seeking safety at the US border. Costume: Sandy blond wig + acoustic guitar + hay = Sheryl Scarecrow. ROCK CANDY: For a different kind of feel-good hit parade, the 10th anniversary tour of the beloved ’80s rock jukebox musical “Rock of Ages” is teased, feathered, and ready for action at the Boch Center Wang Theatre through Oct. 28. Playing the role of Sherrie (i.e. she who SHOULDA BEEN GO-ONE!) is Andover’s own Katie LaMark, whose homecoming is also her debut on the Wang stage. Find tickets here. Costume: nun costume worn backward = Twisted Sister. LAUGH IT UP: Elsewhere in homecomings, you can catch the “fiercely funny” comedian Mehran at the Comedy Studio’s gradually-irrevocably-less-and-less-new location in Somerville’s Union Square. The self-described “gay, Iranian, messy, aggressive, fabulous, queer, freak, perfect, lovable Masshole” not only makes his debut on Comedy Central this weekend but makes a return to where he got his start to record an album-length set on Sunday — one that could preserve your violent coughing fit for the ages. Grab tickets here, and maybe get that checked. Costume: Oversize blazer + zombie makeup + fake blood + boom box looping “Never Gonna Give You Up” = Rick Ghastly. FAMILY MATTER: Globe theater critic Don Aucoin calls the new SpeakEasy Stage production of “Fun Home” — the groundbreaking, Tony-winning musical adaptation of Alison Bechdel’s graphic novel — a “powerful” show with a “terrific cast” and a “superlative seven-piece band” that “reconfirmed my conviction that what Jeanine Tesori (music) and Lisa Kron (book and lyrics) have created ranks among the greatest musicals of our time.” It’s up at the Calderwood Pavilion, Boston Center for the Arts, through Nov. 24. Find tickets here. Costume: You + time = Your parents. IN VOGUE: On Friday and Saturday at New England Conservatory’s Plimpton Shattuck Black Box Theatre, you can catch the Bessie Award-winning company Ephrat Asherie Dance, “known for its inventive movement language, which combines contemporary dance with street and club dance,” according to Globe correspondent Karen Campbell. The company helps launch a new Celebrity Series of Boston initiative with “Odeon,” Asherie’s first full-length piece, which “unfolds to the music of Brazilian composer Ernesto Nazareth.” Find tickets here. Costume: Leotard + hockey mask + machete: Merciless Cunningham. POWER UP: At Boston College’s McMullen Museum of Art, you can take in the over 120 photographs, videos, and mixed-media works that comprise “Carrie Mae Weems: Strategies of Engagement,” a probing exploration of race and gender that reviewer Cate McQuaid says “demonstrates the artist’s cunning use of formats, from photo to video to installation, to expose the fusty, encrusted belief systems that maintain hierarchies.” McQuaid calls Weems “an artist for this moment,” and this exhibition “open-hearted and penetrating.” It’s up through Dec. 13. Find more information here. Costume: lion pelt + wooden club + pet dinosaur = Literal B.C. student. CHORAL PLEASURE: And finally from the outside world, Boston Symphony Orchestra music director Andris Nelsons begins a six-week series of performances at Symphony Hall, starting with the Tanglewood Festival Chorus (led by BSO choral director James Burton) taking on Maija Einfelde’s “Lux aeterna,” followed by Nelsons conducting a super-size BSO in Mahler’s Symphony No. 2, featuring the TFC, soprano Ying Fang, and mezzo-soprano Bernarda Fink. That’s Friday and Saturday at Symphony Hall. Find tickets here. Costume: bear suit + three-piece suit+ fake blood = Gustav Mauler. 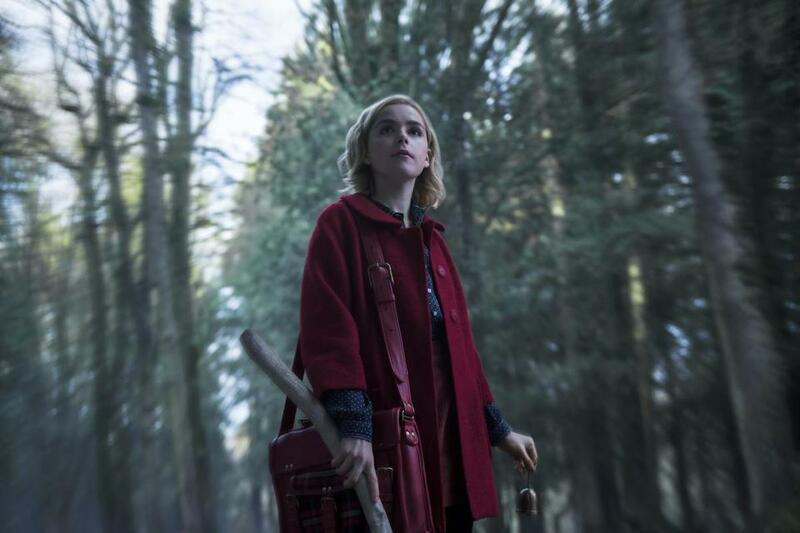 You can get all witchy with the newly undead “Chilling Adventures of Sabrina.” Starring erstwhile “Mad Men” wunderkind Kiernan Shipka, it is a far cackle from the beloved 1990s series, but according to Globe TV critic Matthew Gilbert “has a great retro look with vestiges of foggy, pulpy horror.” Premieres Friday. Also coming to Netflix this weekend is the new weekly news-chewer “Patriot Act With Hasan Minahj,” a solo outing from the feather-ruffling funny man (and recently departed “Daily Show” correspondent). Looks good! And depressing. But good depressing? Maybe? Premieres Sunday. For something even more brooding and dark than current events (and closer to home) you can catch the start of the sixth season of Showtime’s “Ray Donovan,” a series that Matthew Gilbert calls “a very flawed piece of work” and that often “sounds like a bahn on a fahm filled with livestahk,” but that he deeply, unabashedly loves. You can Liev it up starting Sunday at 9 p.m.
For extra navigational help with the dizzying week ahead in TV (all forms of it), be sure to check out Gilbert’s new “TV GPS” every Monday. And finally, just a (severed) heads up about next weekend, when the Globe throws its next “Globe Live” shindig. The last one was a straight-up hoot, and tickets tend to go fast. SO: In order to give Weekenders a (severed) head start, we’re offering $10 off the ticket price if you buy in advance with the promo code “GlobeSub.” (Severed) head on over to the “Globe Live” site for details and tickets!